How come I have not gotten your support? Are you, as a superpac, going to mail out flyers for me for my district for my campaign? Mahalo for your very candid message yesterday. HIRA Action is extremely sympathetic to the decades-long plight of brave, under-funded, under-supported Republican candidates in Hawaii. 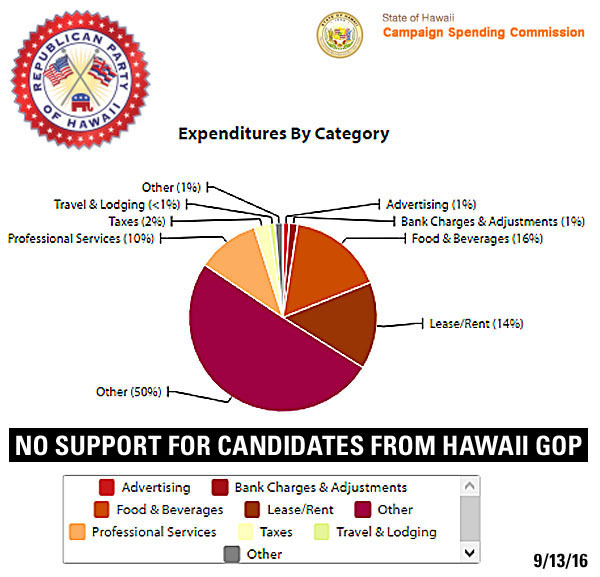 We feel terrible that leaders of the actual political party for Republicans, the Hawaii GOP, refuses to invest in the victory of its own candidates; opting instead to divert all funds to overhead like a fraudulent charity, while refusing to ramp up the precinct-level organizations needed to secure victory. I expect that were your message below to have been directed to Miriam Hellreich, Fritz Rohlfing, Pat Saiki and/or vice chairs Barbara Marumoto (candidate recruitment) and Bob Hickling (coordinated campaigns) at the Hawaii Republican Party , they would have either ignored your request for support or responded with a dismissive one-sentence rejection letter. Indeed, based on their inaction, they don't even seem to care that you are running. As a future lawmaker, surely you are aware that SuperPAC's are prohibited by law from working with candidates. The state's Campaign Spending Commission (CSC) lists HIRA Action among a total of just 16 SuperPAC's authorized to engage in state and local political activity. According to the CSC's explanation: "These are noncandidate committees that have registered and certified with the Commission that they will only be making independent expenditures. "Independent expenditures" means an expenditure expressly advocating the election or defeat of a clearly identified candidate that is not made in concert or cooperation with or at the suggestion of the candidate, the candidate committee, a party, or their agents. See, HRS §11-302." In fact, one such SuperPAC appears to have been shut down by state prosecutors. 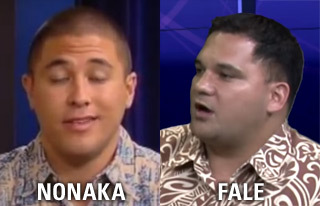 Word on the street is that the fake Republican Hawaii Solutions PAC was run by Democrat consultant Dylan Nonaka (formerly the executive director of the Hawaii GOP) and may have engaged in illegal coordination with disgraced former GOP state representative Richard Fale's re-election campaign. In fact, Fale recently pleaded no contest and was fined a lot of money, which probably signals the self-destructive end of his political career. Quite telling is that the last entry you'll see on the campaign finance report from Nonaka's Hawaii Solutions is a $2,600 retainer fee to an attorney over a year ago. Not surprisingly, Hawaii Solutions hasn't been heard from since then. Even the SuperPAC's website and Facebook page have vanished. But Nonaka and/or his known associates of fellow closet Democrats have reportedly been hard at work on Democrat campaigns from what we've been told at HIRA Action. Anyway, we hope that the CSC's explanation above (along with the background info on what happens when SuperPAC's break the law) helps you to understand why HIRA Action cannot lawfully respond to your request to "mail out flyers for me for my district for my campaign". We understand that because HIRA and HIRA Action have a higher profile and level of activity in the community than the beleaguered, mismanaged Hawaii GOP, you might have assumed (as many do) that HIRA is the party. Actually, if our state and county parties were doing their jobs, HIRA might not even exist in Hawaii as a chapter of the conservative National Federation of Republican Assemblies, which nationally comprise the "Republican Wing of the Republican Party". At HIRA Action, it troubles us greatly that $16,000 per month is wasted by the Hawaii GOP on overhead while not a penny is spent helping to educate and persuade voters about the reasons that a Republican majority would be superior to what Democrats have done after 62 years of failed policies, let alone refusing to invest in the brave Republican candidates who step forward every two years. Perhaps you will join with HIRA after November 8th so that together we will be able to fix all that is broken with our state party. Once our 'fake opposition' party of do-nothingness has been retooled into a genuine 24/7/365 opposition party, then brave GOP candidates in 2018 and beyond will finally get their shot at political victory they deserve. Finally, despite our limited resources , please know that HIRA Action will continue to challenge the record of Democrats while promoting the conservative solutions of Republicans with careful and deliberate use of every penny contributed by supporters across the state. 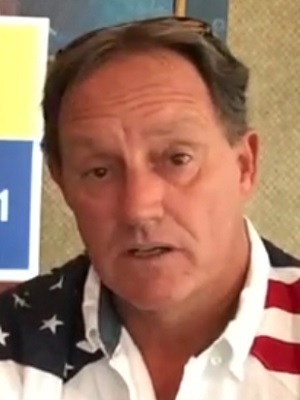 While these functions are actually among the many deliberately unfulfilled responsibilities of the Hawaii Republican Party, HIRA Action does what it can in the belief that it is completely unfair for you and other candidates to knock on doors and wave signs and make phone calls while challenging Democrat politicians whose failed policies have gone completely unchallenged by our party during the two years prior to each election. HIRA and HIRA Action are trying to fill the void while closet Democrats and other defenders of the status quo have hijacked the Hawaii GOP and kept our party on the sidelines. Thanks again, Mr. Pekus, for writing and especially for running in 2016. Though we have not met, I really do appreciate your service to your community and to fellow Republicans by standing up as a candidate for public office. HIRA hopes that GOP members will attend your forthcoming fundraiser, in Kihei, next Friday, September 23rd. Please accept our most sincere best wishes to you and your team and your family this November 8th! P.S. We could not help but notice that your website's testimonials list Bonnie Wharton as a "Member of Republican National Committee" or RNC. Please know that this is untrue. She attended the recent national convention with the Hawaii delegation (a very short-lived and noninfluential role). But the only "members" from Hawaii of this very exclusive group of just 168 individuals who make up the membership of the RNC are national committeewoman Fritz Rohlfing, national committeeman Gene Ward, and state chairman Fritz Rohlfing - all of whom made the empty promise to GOP candidates in 2016 that they would feel supported by the Hawaii GOP. We sincerely hope that Ms. Wharton did not misrepresent herself to you as a member of the RNC. If memory serves, Ms. Wharton DID play a decisive role in 2010 on the party's Platform Committee by voting in favor of adopting an official platform which declares the Hawaii GOP and its members as being officially neutral on all issues affecting the people of Hawaii, despite the incredibly harmful policies of the Democrats which seem to cry out for repeal of said policies and enactment of Republican solutions. No wonder Hawaii voters are so confused about Republicans, since that platform has been officially on the books - guiding the party's official messaging and actions - for the past six years. Please know that both the Hawaii Republican Assembly and HIRA Action support the replacement of our state party's weak platform with a bold set of proposals which would change Hawaii for the better and give voters a real choice in 2018 and beyond. P.P.S. 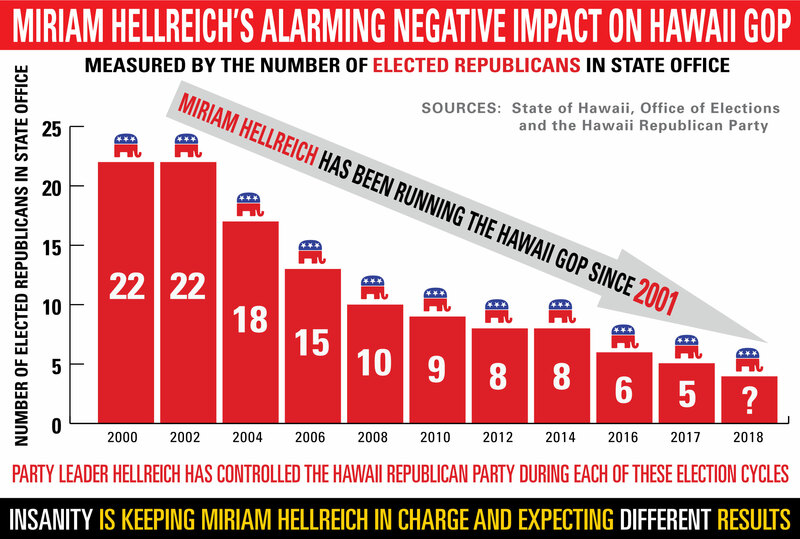 Below is a chart which HIRA created in order to keep track of Miriam Hellreich's sorry track record while the longtime de facto leader of the Hawaii GOP for the past two decades. At a time like this, candidates like you often feel alone and disconnected from a greater sense of purpose shared by other candidates in your shoes. Please know that you are definitely NOT alone, as Team Hellreich has thrown many candidates to the wolves in the past several decades; including the current 2016 election year. 99% of you have experienced the same feeling of being set up to fail. HIRA and HIRA Action are committed to making the right changes desperately needed at the Hawaii Republican Party if we ever hope to become our state's majority political party (the only real way to implement our policies), rather than a make-believe 'opposition party' perpetuating a fraud on GOP members and candidates who don't realize that our party's leaders have no intention of ever leading the Hawaii Republican Party to victory. After November 8th, we invite you to join with HIRA in rescuing our party from closet Democrats and RINO's. Only then will Republican candidates and Republican policies get true support rather than worthless lip service.